Sometimes a caregiver is a trained, paid specialist, but many times it’s a family member who is trying his or her best to care for a loved one with Alzheimer’s or another dementia-related disease. Those in that situation can often feel overwhelmed and suffer from anxiety and stress-related health problems of their own. A four-session course designed to educate individuals who may be working in that role is being offered by the Sunshine Terrace Foundation. It begins Feburary 20th and continues through March 13th and it’s free of charge. On KVNU’s For the People program last week, one of the certified Dementia Dialogue instructors, Dennis Wildman, was our guest. He said taking care of someone with dementia is much harder than otherwise caring for an elderly parent, for example. 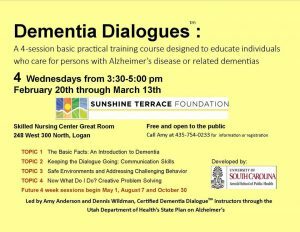 The training session will take place in the Skilled Nursing Center Great Room at 248 West 300 North in Logan. For information, or to register, call Amy Anderson, who will be the other instructor at (435) 754-0233.